In May 2007, Dean and Dawn Seifert purchased a low volume Minuteman Press design, marketing, and printing franchise from another couple that was retiring. 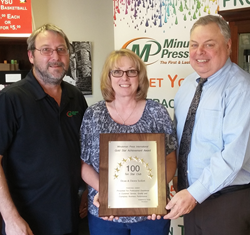 Thanks to their hard work and by following the Minuteman Press franchise system, Dean and Dawn have successfully grown their business in Youngstown, Ohio, which continues to flourish nine years later. Youngstown, OH Minuteman Press franchise owners Dean Seifert (left) and Dawn Seifert (center), along with Gary Nowak (right), Minuteman Press International Regional Vice President for the Ohio region. Dean and Dawn Seifert have owned and operated their Minuteman Press design, marketing and printing franchise at 3200 Belmont Avenue in Youngstown for nine years, and they have refused to participate in an economic recession or depression. Dean and Dawn Seifert have owned and operated their Minuteman Press design, marketing and printing franchise at 3200 Belmont Avenue in Youngstown for nine years, and they have refused to participate in an economic recession or depression. Dean and Dawn purchased a low volume Minuteman Press franchise for sale from another couple that retired, taking over the business in May 2007. Dawn came from the financial industry and Dean came from a sales background. By virtue of their hard work and following the Minuteman blueprint for success, their business grew and flourished every year over year. During the first two years in business, Dean and Dawn Seifert phased out offset printing and completely switched over to all digital printing. With digital printing, they were able to sell higher quality products to their clients with a much faster turnaround. Today's Minuteman Press franchises in 2016 are digital print, design, and marketing centers. Over the last few years, they have grown by offering signs, banners, custom apparel, and promotional items to their very loyal customer base. Dean and Dawn have received the Top Customer Service Award from Minuteman Press International, and in the process have benefited from receiving tremendous repeat business. Two of Dean and Dawn Seifert's children – Bill and Jen – work eagerly in the business. Jen works in graphics and production, while Bill works in sales and marketing. "As a family-friendly franchisor, Minuteman Press International is proud to have second-generation workers like Bill and Jen, as well as many second-generation owners throughout the franchise system, involved in the business," said Gary Nowak, Minuteman Press International Regional Vice President, Ohio region. Dean Seifert attributes the success of the business to "never saying no" to a customer request that is reasonable. He feels if he can help a customer with a request that someone else won't do or can't do, then he’ll get all of that customer's work…eventually. Dean is also a big proponent of making deliveries to his customers, as he feels it's also the best way to upgrade customers, make them aware of other Minuteman Press products and services, get referrals, and, most importantly, to continue building relationships. What's next for Dean and Dawn Seifert? They are striving to join the Minuteman Press International President's Club for top-performers this year. People complain about economic downturns and sometimes use it as a reason to explain the lack of growth of their business. Dean and Dawn Seifert are shining examples of taking the opposite approach, and their hard work has paid off. For more information on Dean and Dawn Seifert's Minuteman Press design, marketing and printing franchise in Youngstown, Ohio, call (330) 759-7414 or visit their website: http://www.youngstown.minutemanpress.com. Learn more about Minuteman Press franchise opportunities at http://www.minutemanpressfranchise.com. Youngstown, OH Minuteman Press franchise owners Dean Seifert (left) and Dawn Seifert (center), along with Gary Nowak (right), Minuteman Press International Regional Vice President for the Ohio region. Minuteman Press franchise locations offer a wide range of creative design, digital printing and marketing services to businesses and clients.